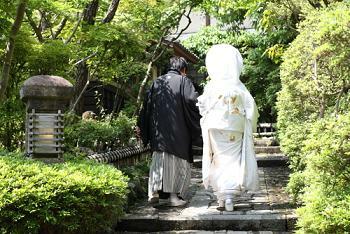 Last week, I went to support the wedding reception at Ryotei SAAMI after the ceremony at Kamigamo Shrine. The day before the wedding day was a rainy day, but the wedding day had a clear blue sky. The greenery at Maruyama park was increasing its brightness with raindrops. The dinner with families and relatives was a great time full with everybody’s smiles and laughters. When the mother said, “Maybe I was the most one who had fun today,” I felt afresh that, she was the one who most have been close to the bride and groom, and she may have been looking forward for this day so much. The warm words from bride and groom also made me glad. I wish for the bride and groom and their families every happiness.